Navaratri is being celebrated from the dates of October 13 to 21 in 2015, and will culminate with Vijayadashami on October 22. These nine nights celebrate the Divine Feminine, and are a time of great festivity in India. It is a wonderful opportunity to acknowledge the presence of divine feminine qualities within each one of us. Since years there is a deep misconception about the roles of masculine and feminine energy in the world. It has always been misunderstood with male and female as a form instead of the qualities.Feminine is a quality both witnessed in male and female. Woman is an embodiment of feminine qualities more as compared to men that is how it is meant to be. The masculine energy is a dominant energy, while feminine energy is a submissive energy this was a popular belief which many people are still living today. This has led to a revolution among women where there is an active role reversal to be in a position of power. This war between the masculine and the feminine has caused many women to forsake their femininity in an attempt to equality, and many men to forsake their masculine energy out of guilt or embarrassment. 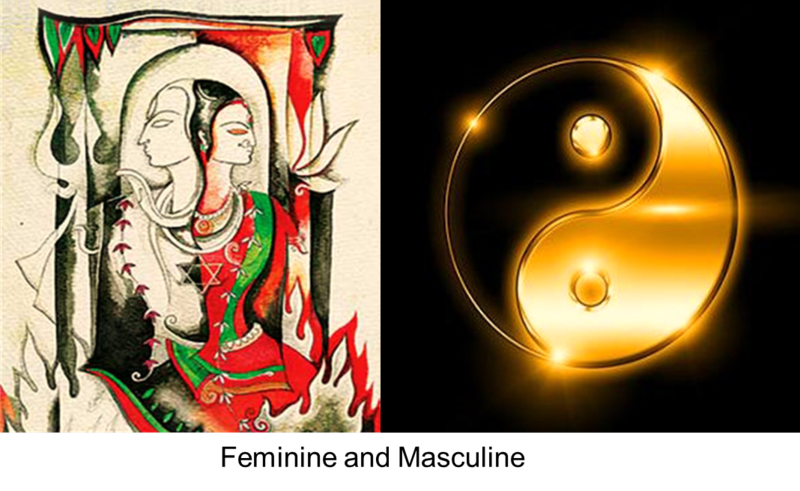 However in reality an ideal human being is one who is balanced.In Hindu Mythology this is represented by Shiv and Shakti Ardhanarishwar (Lord Shiva and his consort Shakti ) In chinese tradition it is represented by Yin and Yang circle. Whenever a power becomes active, and wherever energy exists, Shakti is working. Other terms for these primal principles are PURUSHA and PRAKRITI; Purusha is consciousness and Prakriti is form and nature. Īshwara is the omnipresent, eternal, formless divine principle; Purusha is the Ātmā and Prakriti is the form ,manifestation, nature. An electric light can be used to explain their relationship. The electric current, which is the source of the light, is Īshwara; the light is Purusha, and the object that is illuminated is Prakriti. A lot of relationships are undergoing transformation with the rise in the earth vibrations some are feeling the change now whereas some have been struggling with the changes for past few years. SHAKTI (or Prakriti) means energy, power, movement,change, nature. It is the maternal principle – the provider, abundance. In the human as well as in the animal kingdom the mother offers nourishment, warmth and security. There is no greater love than the love of a mother. The mother carries and nourishes the child in her own body. When it is born she provides it with mother’s milk and raises it at the sacrifice of her own self until it becomes self-reliant. Shiva and Shakti are manifestations of the all-in-one divine consciousness – different sides of the same coin.In many pictures these two primal powers are each depicted as being one half of the same image; one side female and one side male. The left side is the Divine Mother, Pārvatī, the “feminine” energy, and the right side represents Shiva, the “masculine” consciousness. The balance between Purusha and Prakriti, Shiva and Shakti is the equilibrium. 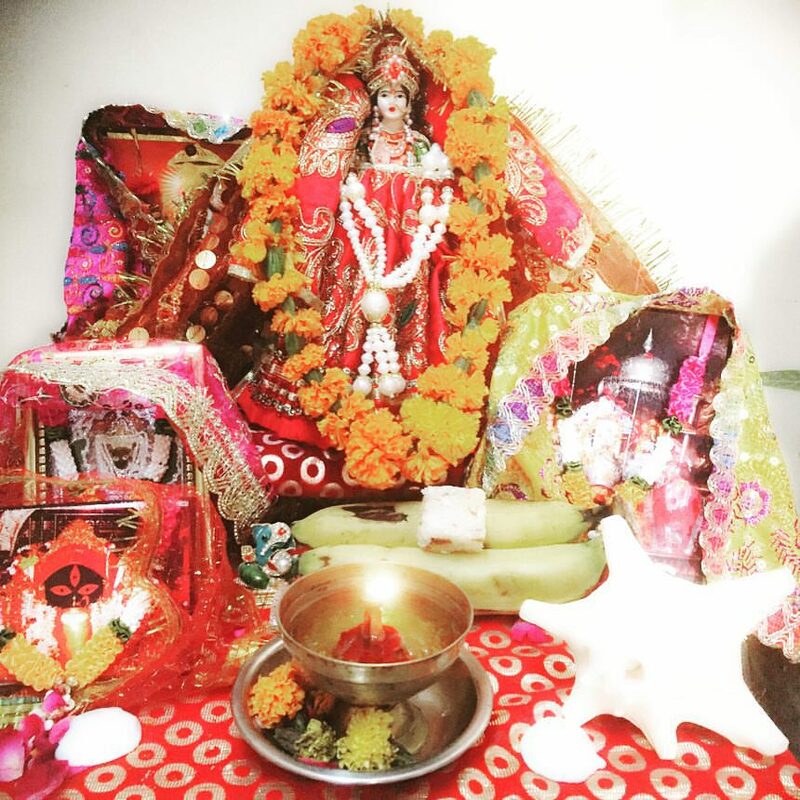 Navratri celebrated in India is a beautiful time to connect with the divine feminine within to open up to grace of the qualities, like compassion, patience, creativity and nurturing. Our world needs more feminine energy to understand and appreciate life. The nine days of Navaratri are classified as per the three basic qualities of tamas, rajas and sattva. The first three days are tamas, where the goddess is fierce, like Durga and Kali. The next three days are Lakshmi related – gentle but materially-oriented goddesses. The last three days are dedicated to Saraswati, which is sattva. It is related to knowledge and enlightenment. If we can celebrate Navratri by understanding and being receptive to these qualities this will lead to the real victory which is celebrated as Dussera. We have all been engaged in mythological stories since our childhood but these traditions in the oldest culture of the 5th Root Race have deeper significance than we can comprehend. I invite all of you to celebrate this festival with full awareness and receptivity to be able to shift your energies to a higher level. Not just being engrossed in the paraphernalia but being able to connect within. The ritual preparation will become an add on to the entire process sharing the pic of my altar with all of you.